Peabody Museum of Archaeology and Ethnology,, 9780873651264, 481pp. From 1935 to 1939, the Peabody Museum sponsored an archaeological expedition at the ancient Pueblo and early Spanish colonial site of Awatovi on the Hopi Reservation in Arizona. The multidisciplinary project attracted professional and avocational scholars from a wide range of disciplines. Former lawyer Watson Smith was, at the time, an enthusiastic amateur archaeologist. He joined the expedition as a volunteer during the 1936 season and became one of its most productive researchers, as well as one of the Southwest's foremost archaeological scholars. 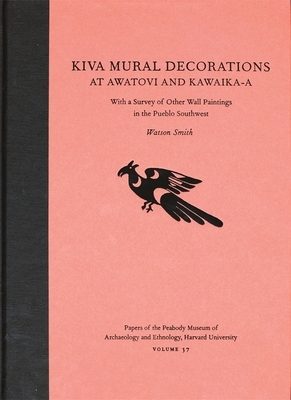 In this classic volume of the Peabody Museum Papers series, first published in 1952, Smith reported on the remarkable painted murals found at Awatovi and other Puebloan sites in the underground ceremonial chambers known as kivas. Now reissued in a stunning facsimile edition, the volume includes color reproductions of the original serigraphs by Louie Ewing. Smith's groundbreaking work first brought to public and scholarly attention the sacred wall-painting tradition of the aboriginal American Southwest. The aesthetic power and symbolic imagery of this artistic tradition still fascinates today. Archaeologists, art historians, collectors, and artists alike will welcome the return of this long out-of-print classic.